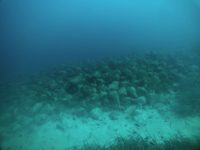 For decades the prospect of looters and even well-meaning recreational divers damaging Greece’s vast underwater cultural patrimony made SCUBA diving illegal in Greek waters. 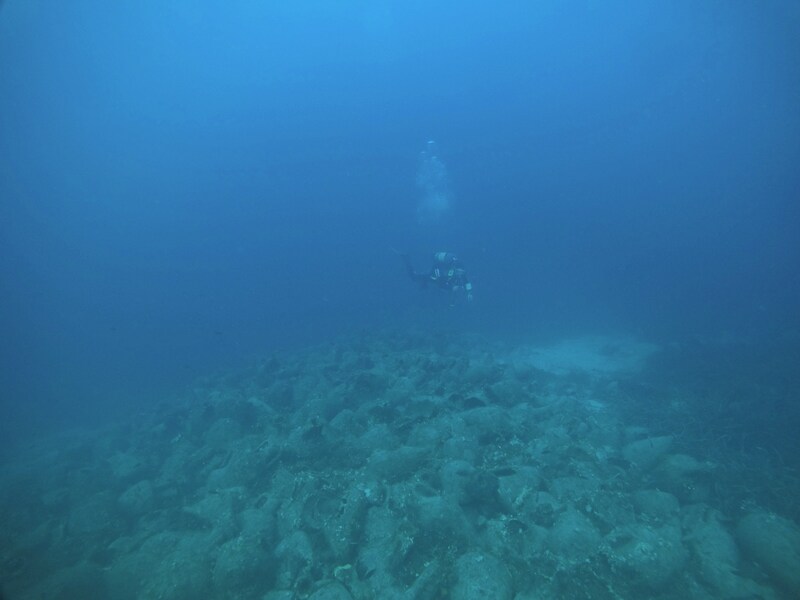 Since 2005 diving has been allowed but only in very restricted circumstances, mainly to archaeological teams excavating ancient shipwreck sites. A new initiative under the BLUEMED program will now open ancient shipwrecks to the public who will be able to explore the sites via guided diving. 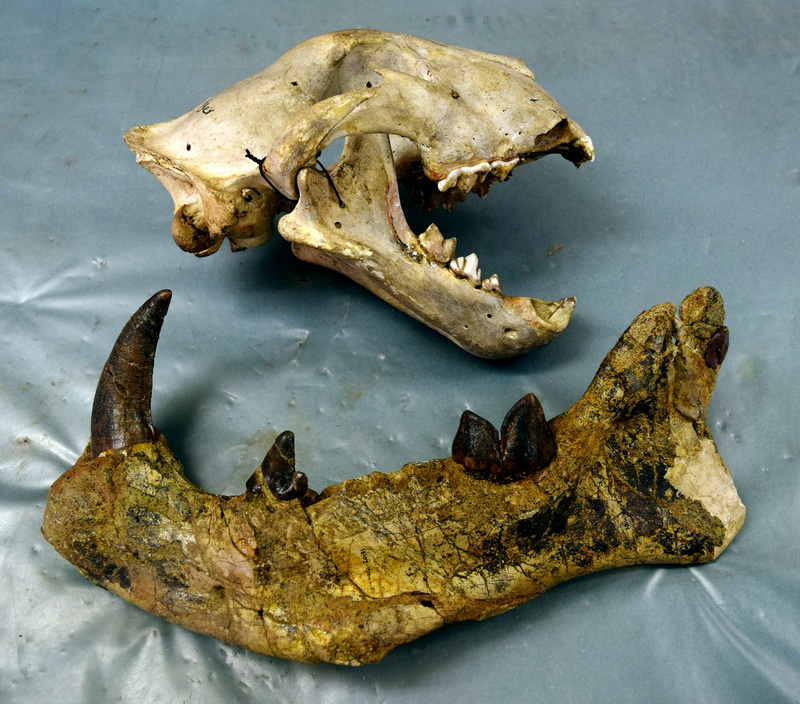 The first site to open is a 5th century B.C. wreck found near the uninhabited island of Peristera opposite the island of Alonissos. When the Peristera wreck was discovered and excavated in the early 1990s, it upended the historical understanding of ancient Greek shipping. Before this discovery, historians thought the largest merchant ships in Greece were built by the Romans in the 1st century B.C. and were no more than 70 tons carrying 1,500 amphorae. The Peristera ship was huge at 126 tons, the largest ship of the Classical era ever found in the Aegean, and it carried a cargo of more than 4,000 amphorae (that we know of; there was almost certainly other cargo on board that has not been found). While any exposed wood of the ship itself has rotted away, the great mounds of amphorae surviving in situ make for an incredibly dramatic vista in a setting of great natural beauty within the National Marine Park of the Northern Sporades. 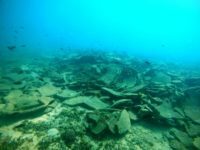 Three other shipwrecks in the West Pagasitikos area have been selected as pilot sites for the tour program by Greece’s Ministry of Culture and Sports. 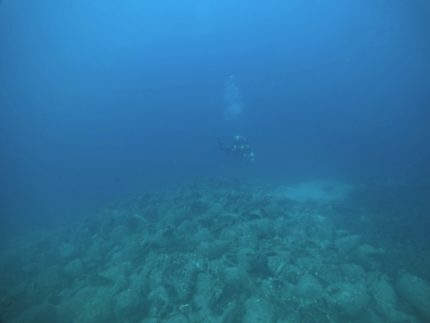 To prepare these locations for diving tours, Ephorate of Antiquities experts inspected the shipwrecks, cleaning them of trash and any modern interventions, documenting their current condition and status in exhaustive detail and designating “microregions” of the underwater archaeological monuments to serve as diving tour routes. The wrecks and topology of the seabed were surveyed with 3D scans and high-resolution photogrammetry performed by autonomous submarine vehicles. The ecology of the sites were also mapped and documented with a particular focus on the biodiversity of the marine environment. The first of the guided tours took place last weekend with small groups of divers. The boat departed from the harbor of Steni Valla on Alonissos for the short trip to the Peristera wreck. During the jaunt on the boat, tour guides gave the visitors a rundown of the historical context of the shipwreck they were about to explore. Informational panels positioned along the perimeter of the site itself provided more explanation of what they were seeing. 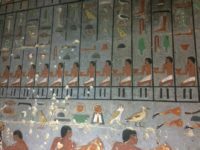 An ancient Egyptian sarcophagus will be opened live in a two-hour television special to air simultaneously at 8:00 PM Sunday on the Discovery, Travel and Science channels. Expedition Unkown: Egypt Live will be hosted by one Josh Gates who is described as an “explorer,” and who in his capacity as a certified SCUBA diver assisted in an archaeological excavation once in the 1990s. Other than that, it seems his bailiwick is hosting TV shows and traveling places. 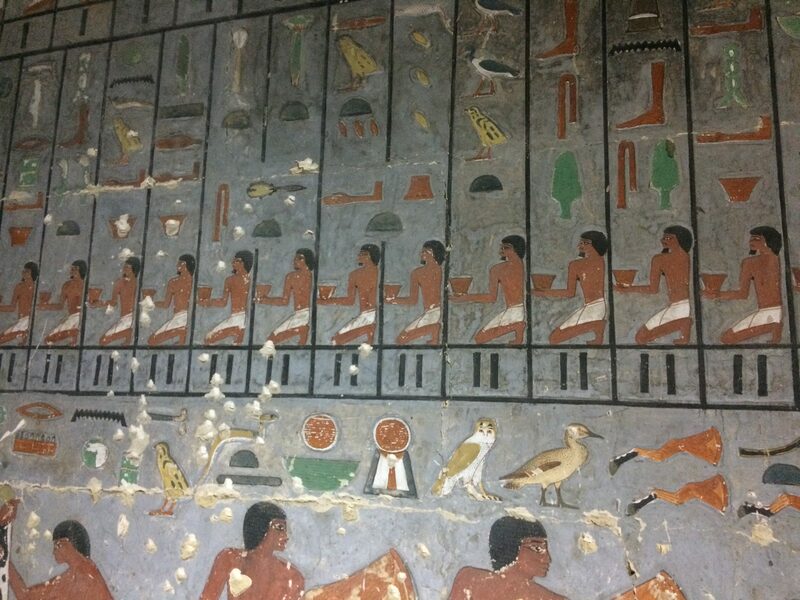 The actual opening of the sarcophagus will be done by archaeologists under the ever-watchful (and promotion-keen) eyes of Egyptologist Dr. Zahi Hawass and Mostafa Waziri, the secretary-general of the Supreme Council of Antiquities of Egypt. The limestone sarcophagus was found in the necropolis of Tuna el-Gebel in Minya province, about 210 miles south of Cairo. More than 50 Ptolemaic era mummies were found there earlier this year. The sarcophagus is likely older than that, however, as it was discovered in deeper chamber. 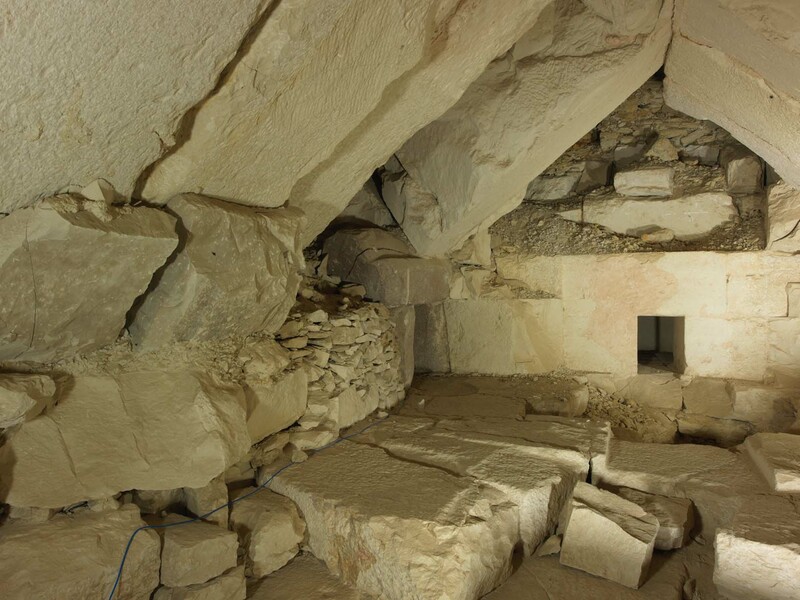 Viewers will have the rare opportunity to see the inner chambers of an excavation site, where archeologists recently uncovered a network of vertical shafts leading to an underground network of tunnels and tombs with 40 mummies believed to be part of the noble elite. The massive underground complex of chambers is a treasure trove of antiquities – all laying undisturbed for thousands of years. 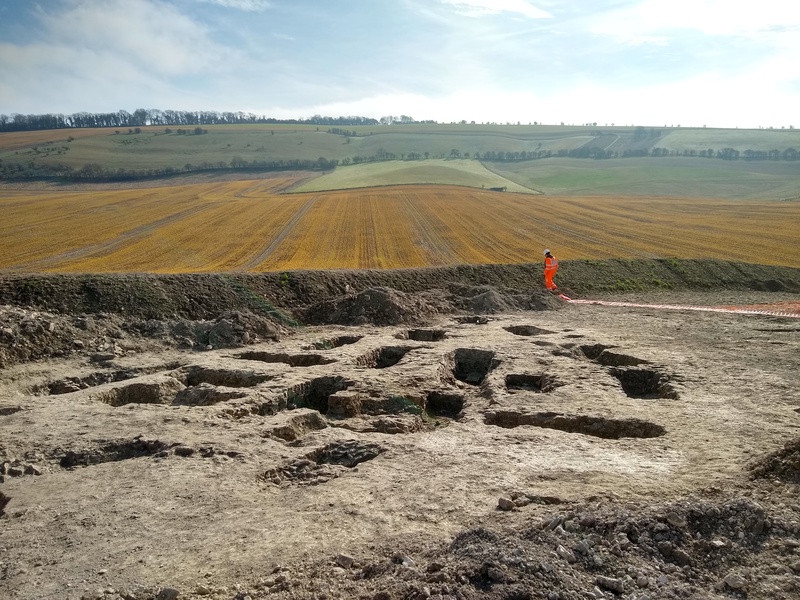 But there are several chambers yet to be explored – and many more discoveries to be revealed, including a mysterious limestone sarcophagus found buried deep within the complex. The identity of the mummy inside has been a mystery for 3,000 years… Possibly until now. 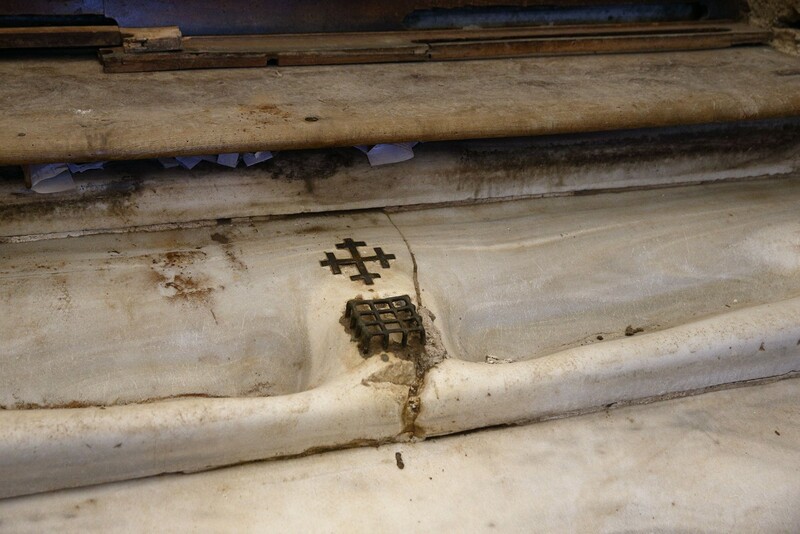 Or even more likely there will be no identifying inscriptions. For that matter, there may not be any mummified remains to speak of remaining inside. 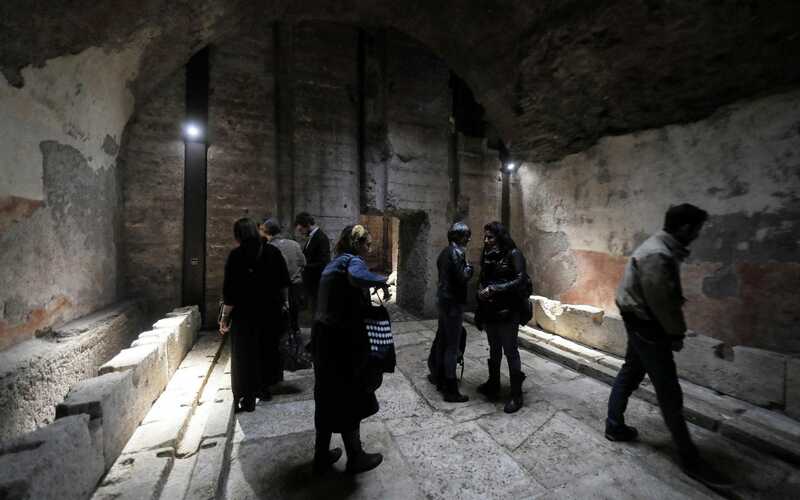 There’s a very strong possibility of an Al Capone’s vault situation here, but the live broadcast works as a marketing tool either way since viewers will get two hours worth of the “come see the ancient wonders of mysterious Egypt” pitch. This is the first time an Egyptian sarcophagus will be opened on live TV, but it’s only the technology that’s been updated. Making a spectacle of the dead of ancient Egypt is part of a long tradition of mummy voyeurism and exploitation going back centuries. Dr. Augustus Granville garbed it in a loincloth of science when he performed an autopsy of the mummy of Irtyersenu before a large crowd in 1825, the surgical theater lit by candles made from what he thought was beeswax he scraped off her mummy but turned out to be Irtyersenu’s own body fat in the form of adipocere. Dr. Thomas Pettigrew became known as “Mummy” Pettigrew for the hugely popular mummy unravelling parties he threw for Victorian Britain’s moneyed elite. Since the fearsome 2,000-strong terracotta army of Emperor Qin Shihuang (259–210 B.C.) 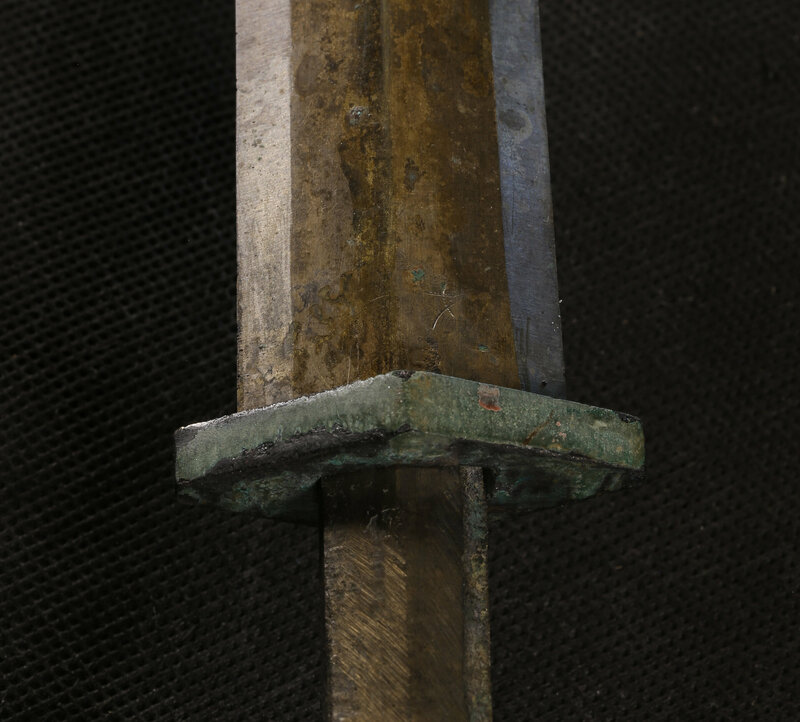 was first excavated in the 1970s, the bronze weaponry has stood out for its remarkably good state of preservation. 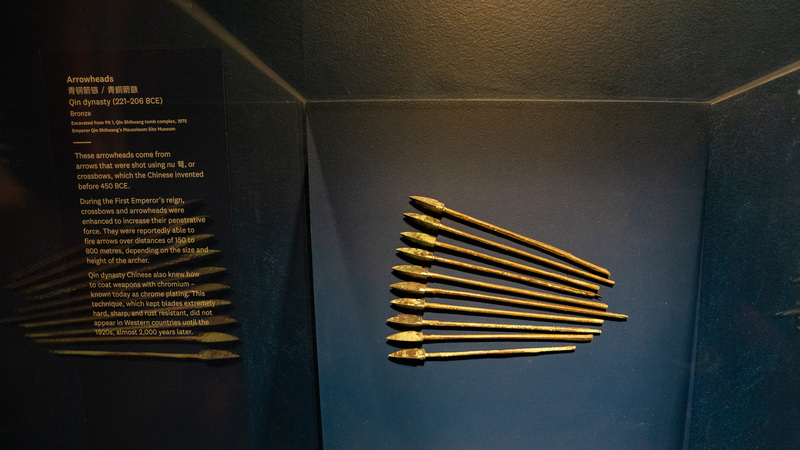 Tens of thousands of arrowheads, spear tips, lances, swords, hooks, crossbow triggers and other bronze parts of complex weapons have survived even as their wooden components decayed to nothingness. Many are still shiny, sharp and show no sign of corrosion whatsoever. Traces of chromium found on the bronze parts have led scholars to hypothesize that the unusually excellent condition was attributable to an early form of chrome plating used as an anti-oxidation measure, a technology only otherwise known to have been invented in the 20th century. A new study published in Scientific Reports suggests that the chromium residue found on the blades was an element in the lacquer applied to the wood or bamboo parts of the weapons — grips, spear handles, lance and arrow shafts, crossbows, etc. — not to the bronze edged parts. In the decay of the organic material, the chromium residue contaminated the blades. In the absence of an anachronistically advanced rust-prevention technology, what then has kept blades and points in such pristine condition? 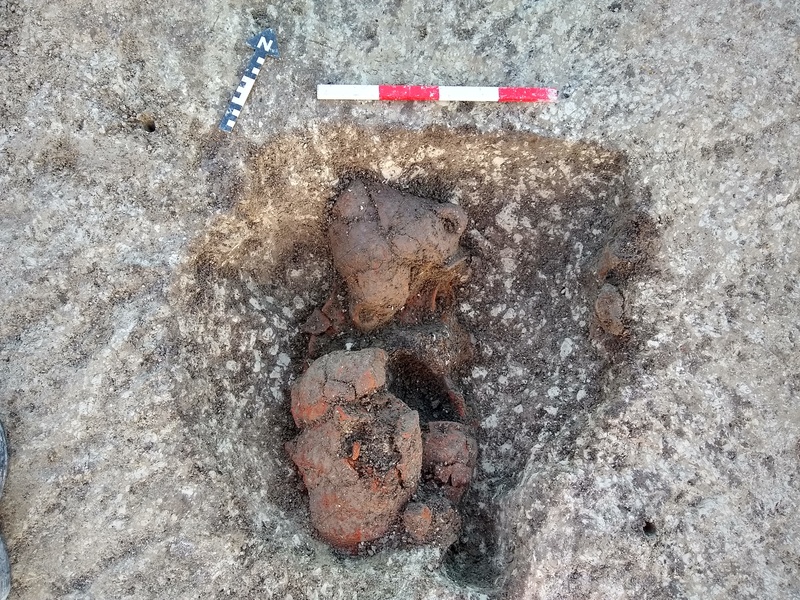 The study authors think the answer is in the composition of the bronze and in the soil itself. Bronzes with higher tin content are prone to develop rich-tin layers on the surface that prevent corrosion. 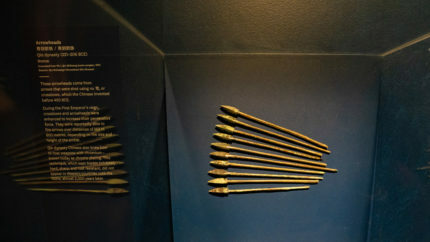 Testing of the surface of batches of bronze arrows from the Terracotta Army archers found the ones with the higher tin content were more stable. The presence of arsenic in the bronze also helped prevent corrosion. The alkali nature of the soil is another highly significant factor that this study is the first to explore. The Terracotta Army is located in the southern edge of the Chinese Loess Plateau, a 640,000 km2 area covered by silt-sized aeolian sediments that make the bulk of the soil. Large-scale models predict pH values around 8–9 for the Lintong area43, and this was confirmed by our on-site measurements of soil samples from Pits 1 and 2, showing pH values between 8.1 and 8.5 (Table S3). Burial soil pH is a paramount parameter predicting metal preservation, as it is correlated with redox potential, drainage conditions, biological activity and aeration. Additional characteristics of loess of potential relevance here are its low organic content and predominantly very small particle size. We propose that the moderate basicity and low organic content of the loess would have prevented the formation of acids that would attack metal integrity. In addition, the very small particle size of the soil would have obstructed the aeration and humidity necessary for metal corrosion. Our proposal is consistent with studies in conservation science which have addressed the optimum conditions for metal preservation in burial environments, noting pH levels of 8–8.5 and small particle size as optimum. 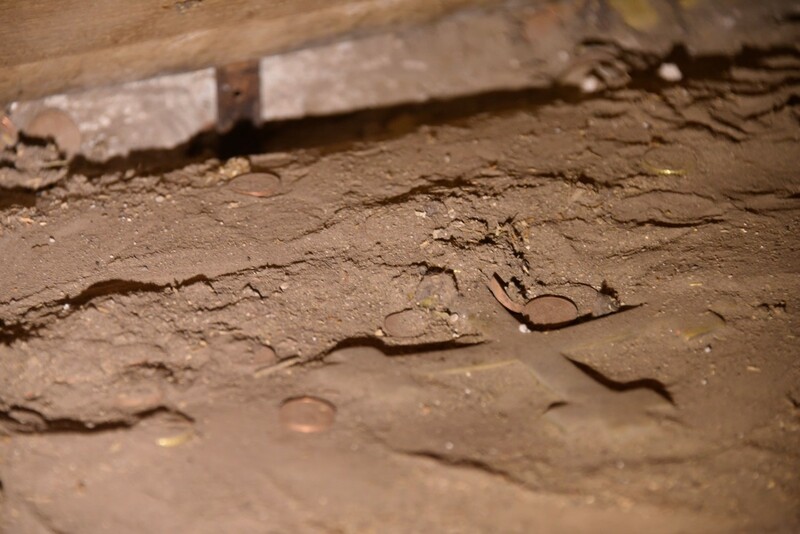 The research team tested the claim by placing bronze tokens in an environmental chamber that created accelerated aging conditions and by burying bronze in soil excavated from Pit 1 of the tomb. The tokens and the buried bronze both remained in pristine condition. A bronze token buried in organic-rich, slightly acidic soil with a pH of 5.9 as a control, on the other hand, quickly showed signs of corrosion. 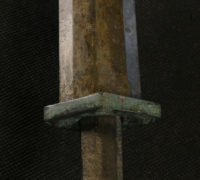 In conclusion, the perplexing suggestion that Qin weapon makers used an arcane chromium-based technology to prevent weapon rust has been refuted. 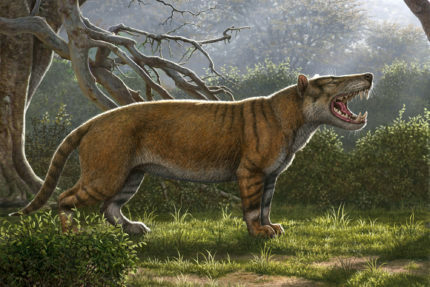 Efforts should be made to update museum displays and other popular literature about the site with this new information. Furthermore, we predict that chromium will be detected on the surface of metal objects from other sites where they may have been in association with chromium-bearing lacquered parts, i.e. more likely on weapons than on ritual bronzes. The use of chromium-rich compounds in the manufacture of ancient lacquer should be in the agenda for future research, together with further technological study of the sharp and lustrous blades. 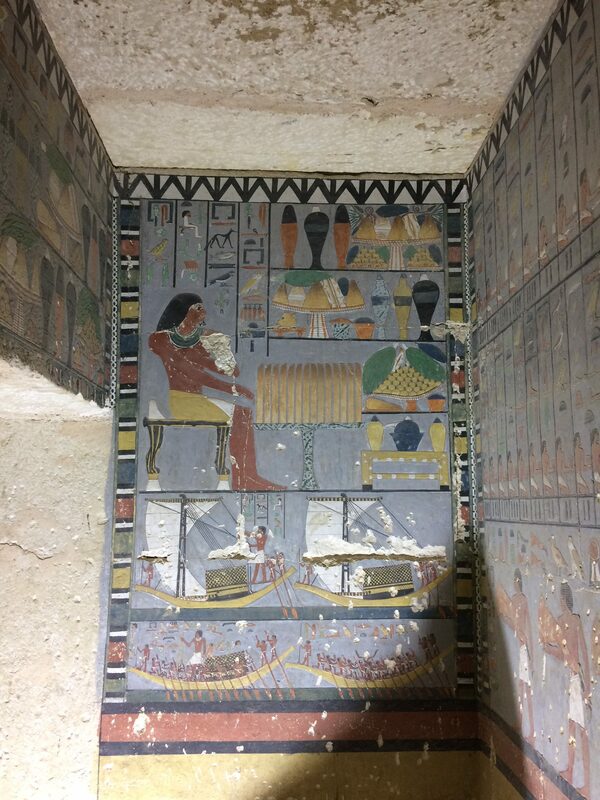 An archaeological mission led by the Czech Institute of Egyptology in Saqquara has unearthed a richly painted tomb belonging to a nobleman from the 5th Dynasty and an inscription revealing the name of an important queen from the same period. The mission was working on consolidating and strengthening the underground chambers beneath the pyramid complex of Djedkare (late 25th century to mid-24th century B.C. 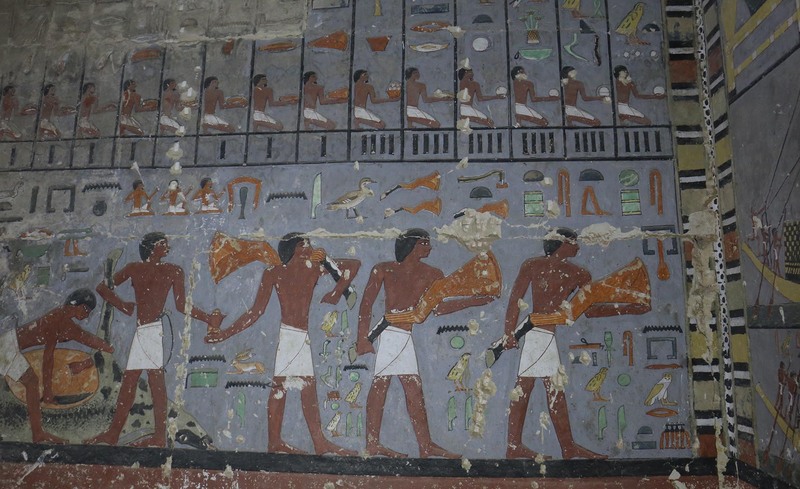 ), the 8th pharaoh of the 5th Dynasty of Egypt’s Old Kingdom. 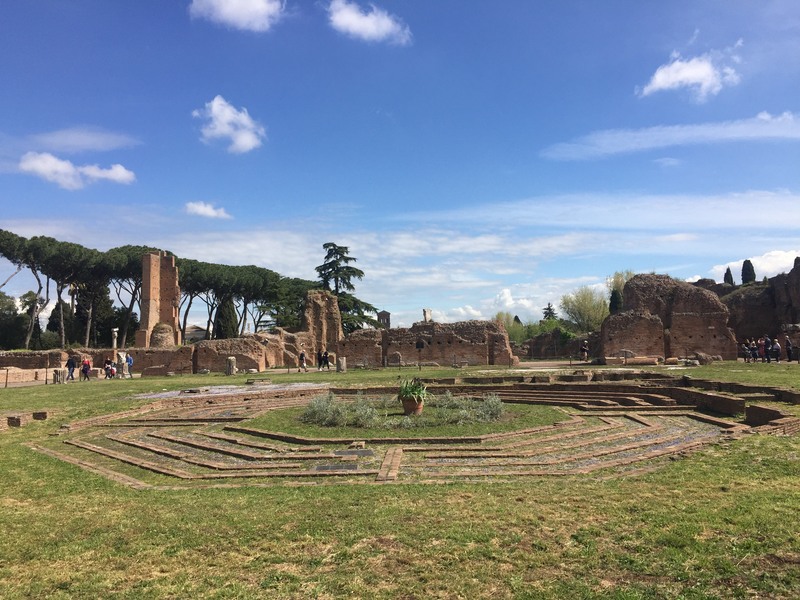 The spaces were in dangerously precarious condition from having been looted of their contents and architectural materials in antiquity and never restored. The remains of the entire pyramid structure were endangered by the structurally unsound foundations. 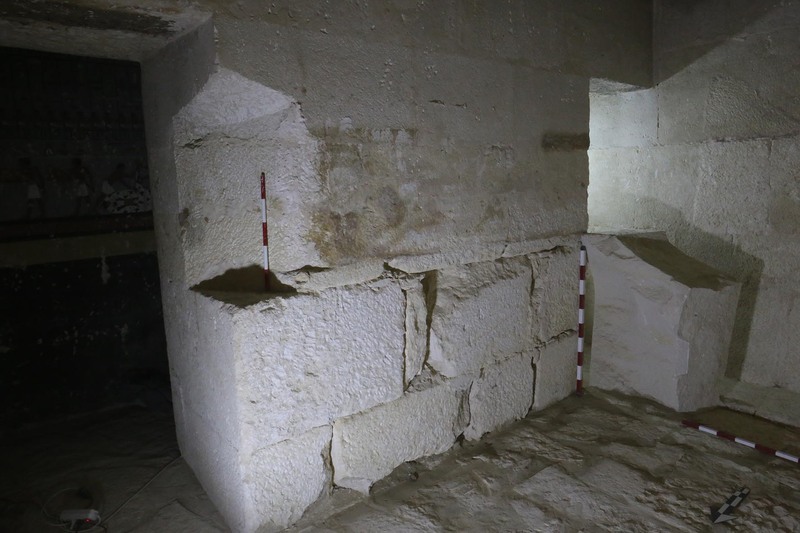 While studying and documenting the area of southern Saqqara around the pyramid, the team discovered the tomb of late 5th Dynasty pharaonic courtier Khuwy. The above-ground entrance to the tomb is an L-shaped offering chamber. Its walls were once decorated with reliefs but only the bottom edge of them has survived, the rest having been stolen by stone thieves harvesting the high quality white limestone blocks. 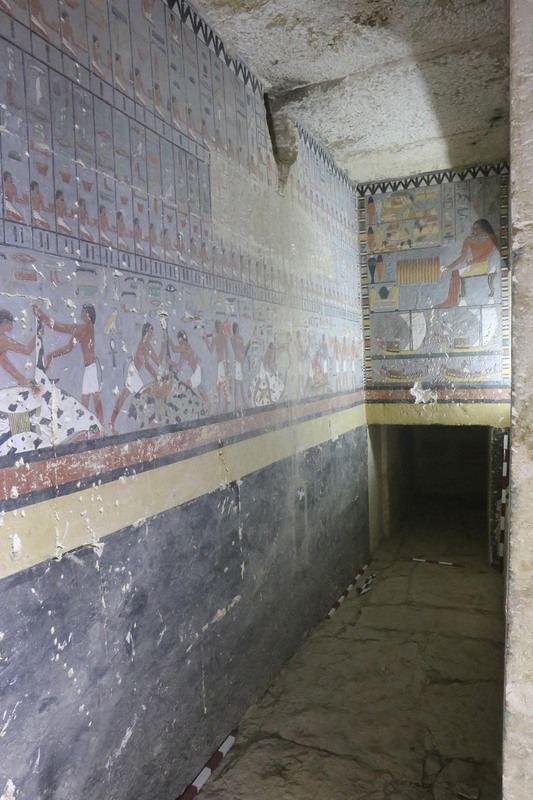 On the north wall of the chamber is an entrance to an underground space that was likely inspired by the substructures of 5th Dynasty pyramids. A descending corridor leads to an underground vestibule. 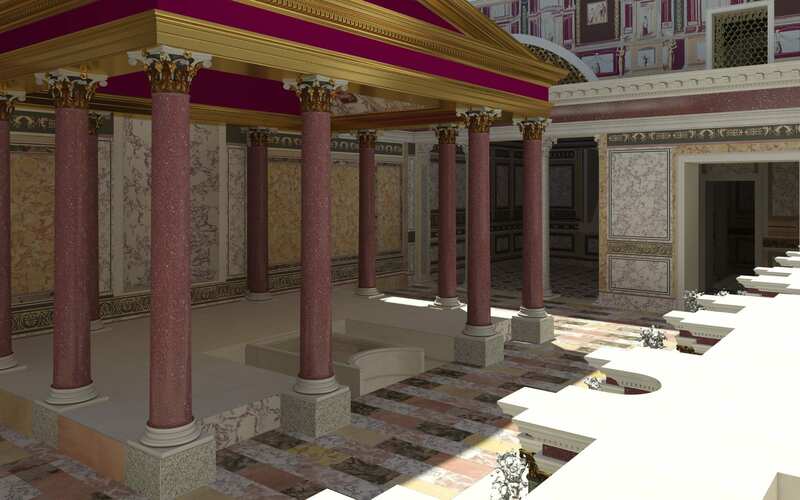 Its southern wall has a shorter corridor that leads into a hall with highly decorated painted in walls. 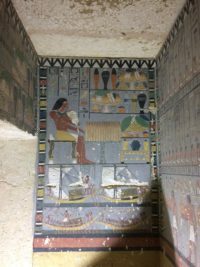 The scenes on the north and south walls depict Khuwy sitting at a sacrificial table. 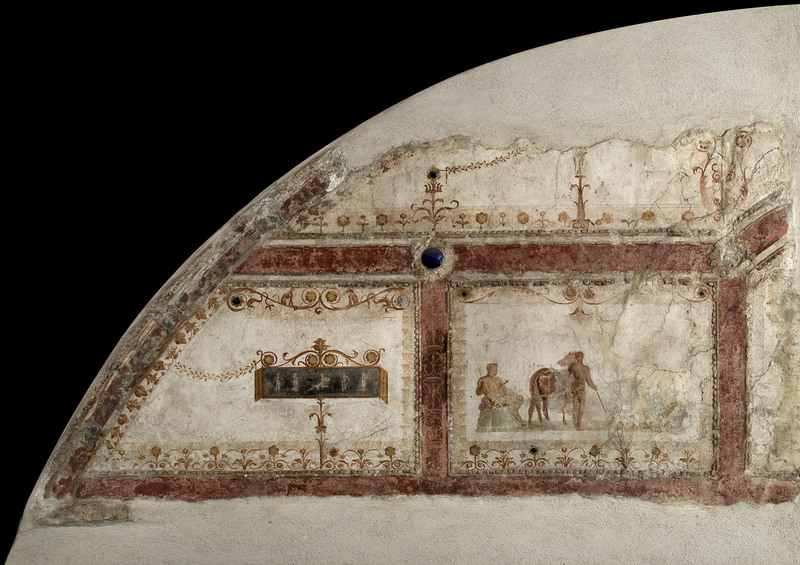 The east wall depicts rows of sacrifices, including a cow in the act of being butchered. The west wall is decorated as a palace facade. An entrance in the south wall leads to a small room used as a warehouse. 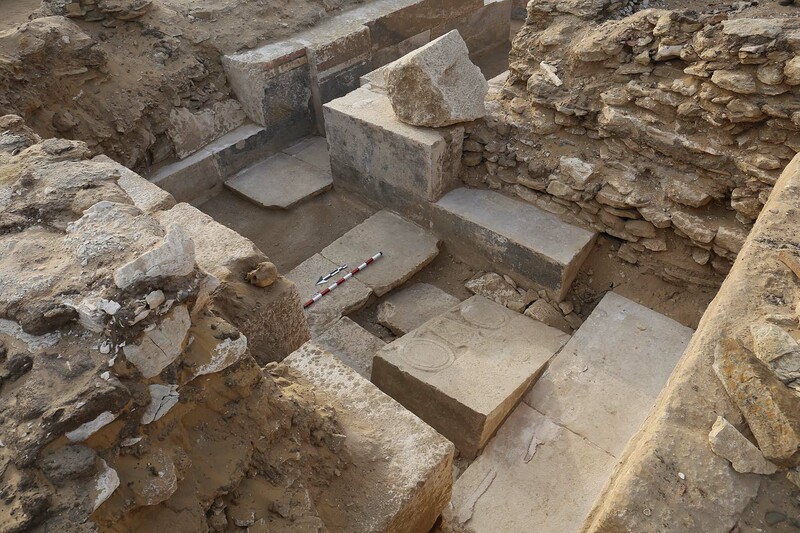 Archaeologists found a few small funerary artifacts in the backfill. 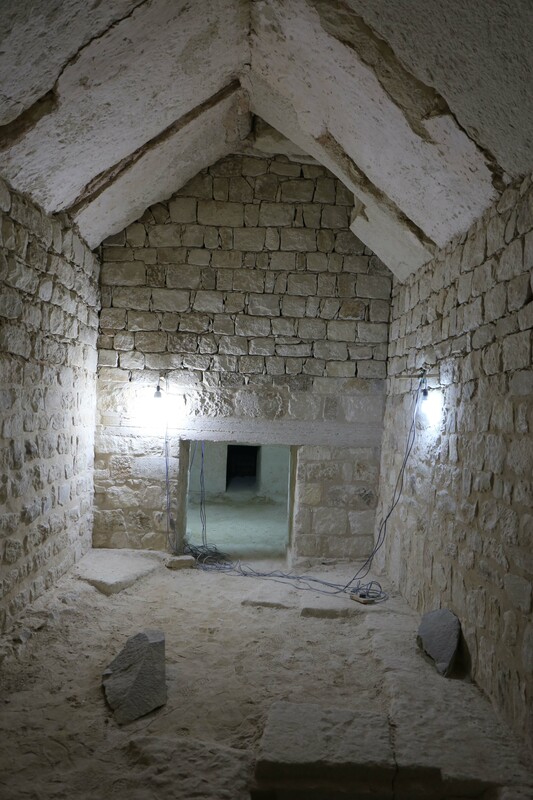 Two entrances in the west wall lead to the interior burial chamber. It is a small, undecorated space. 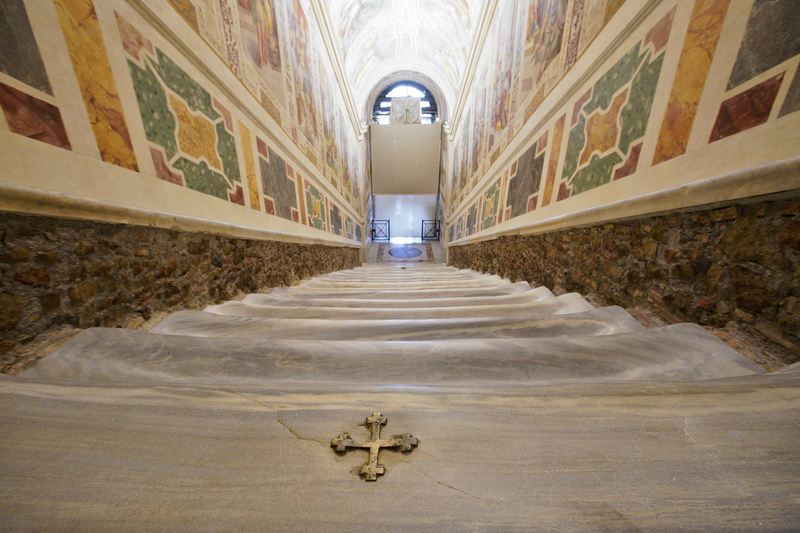 It originally held a limestone sarcophagus that filled basically all of the room. Unfortunately the sarcophagus was destroyed by looters in antiquity. 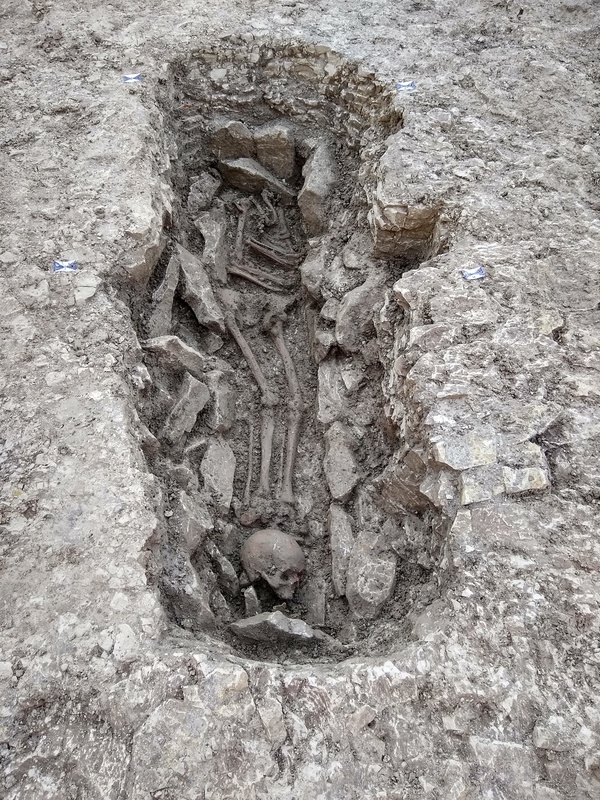 Archaeologists did find a few body parts in the rubble that showed clear signs of having been mummified. Adjacent to Djedkare’s pyramid complex is another pyramid complex dedicated to his queen consort. One of the first pyramid complexes built in southern Saqqara, it is a unique structure that attests to the high esteem she was in by her husband. It is the largest Queen’s pyramid complex constructed in the Old Kingdom and has architectural features, like a massive red granite pillar with a palm capital, only seen in mortuary temples of kings. 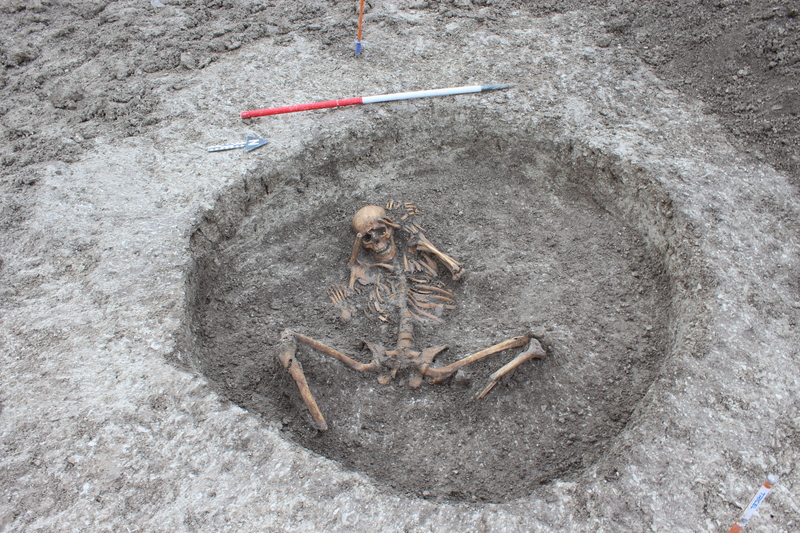 Archaeologists believe she played an essential role in securing her husband’s throne. Despite her great significance, her name was lost and scholars have debated for centuries whose funerary complex this was. The mission has now answered the question. 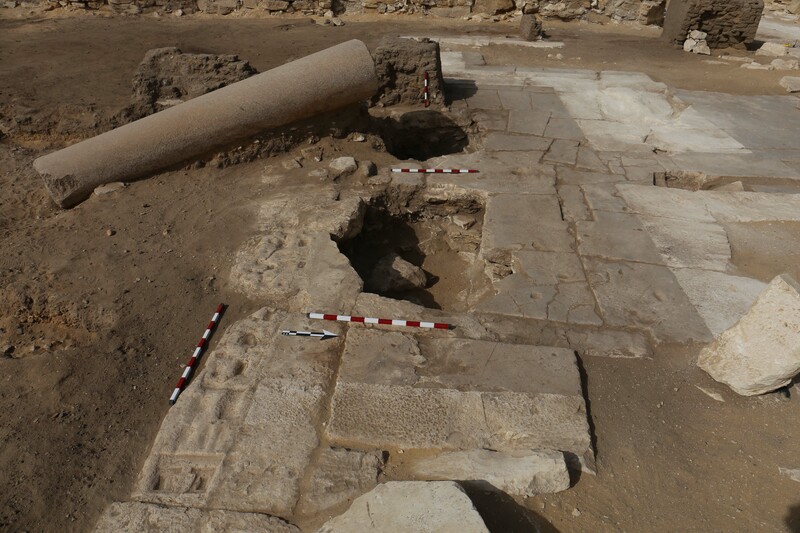 The archaeological investigations and restoration of the pyramid complexes of Djedkare and Setibhor will continue. 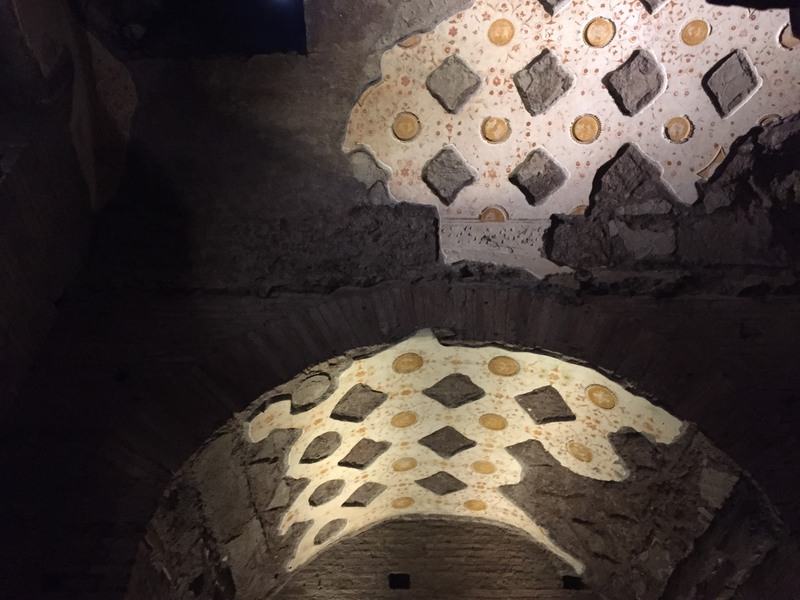 The mission hopes to find more information, perhaps even more tombs, from the important period of transition between the late 5th and early-6th Dynasties. 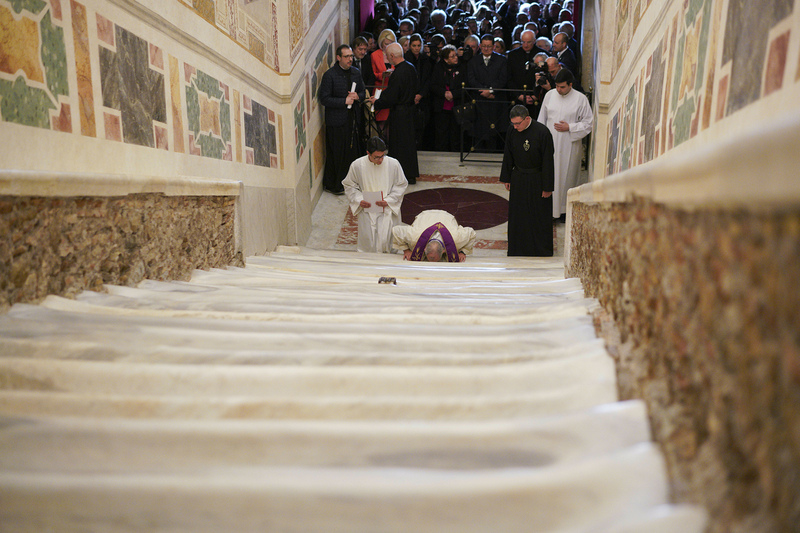 This was a time of great shifts in religious and political ideology. 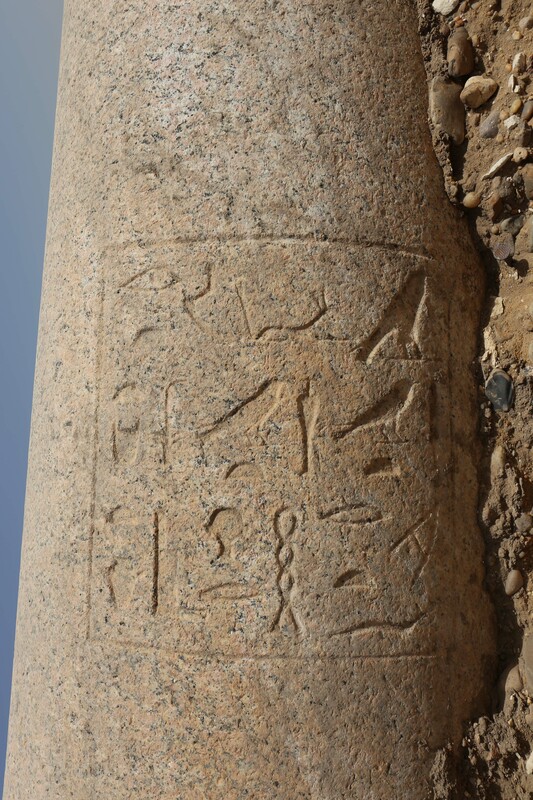 Djedkare was the first king of the 5th Dynasty who did not build a solar temple, for example, and the first pyramid texts were inscribed on the walls of the inner chambers in the tomb of his successor Unas.